Almost two months back, on June 25th, Xiaomi launched the Mi Pad 4, a solid tablet with a powerful Snapdragon 660 SoC, great loudspeakers and a bright fully laminated display. Well, today the Chinese tech giant released its bigger brother – the Xiaomi Mi Pad 4 Plus, a device that brings upgrades in terms of screen and battery size. The Xiaomi Mi Pad 4 Plus does indeed boast a larger 10.1-inch (1920×1200) display with an ultra-narrow bezel design, it’s still equipped with a Qualcomm Snapdragon 660 chip along with 4GB of RAM and up to 128GB of internal storage. Plus we find a 13MP rear shooter, a 5MP selfie snapper and a fingerprint scanner on the front. What’s really exciting though is the increased battery capacity at 8620mAh, which is set to bring some pretty sweet Screen-On-Times. Xiaomi did indeed reveal that the Mi Pad 4 Plus will be able to continuously play videos for 16 hours, you can read text for 18 and play games for 10 hours, which means around one day of really heavy usage. In addition to that, the Xiaomi Mi 4 Plus supports Wi-Fi and LTE like its predecessor, so you can browse the web, watch videos and play online anywhere you go. Finally, what about its pricing? 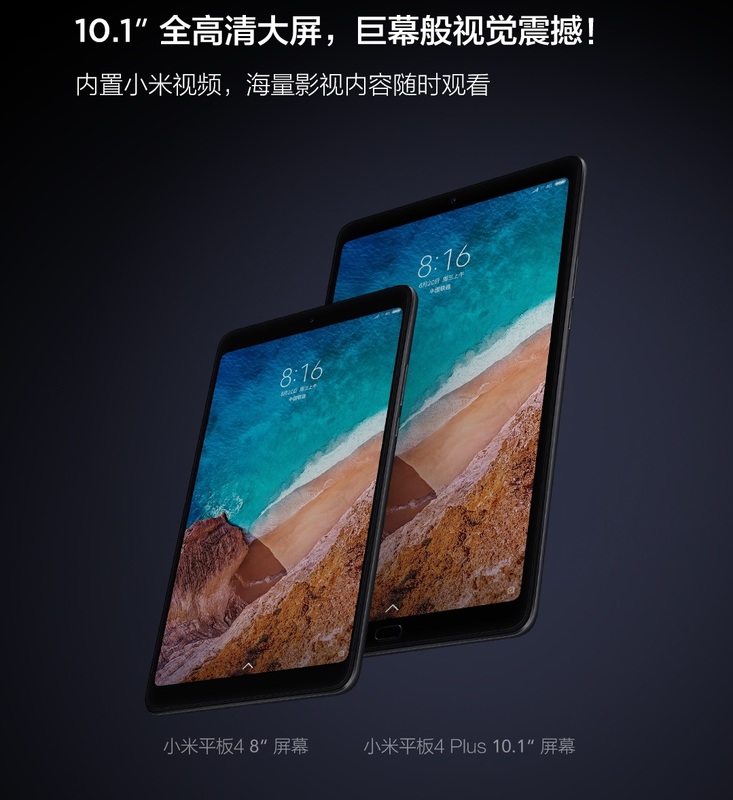 The Xiaomi Mi Pad 4 Plus in the 4GB+64GB version will set you back 1899 yuan, which is around $275, meanwhile the 4GB+128GB variant will go for 2099 yuan ($304). We’ll know more about the tablet on August 16th, when all the minor details will be unveiled. Xiaomi Mi Notebook Air – Xiaomi’s New Notebooks. Does anybody have a workaround? I can’t root till next month to play around myself. Received an email today from Geek Buying with a link to order the 4GB+64GB LTE model for $339.99. It doesn’t say pre-order any longer, so appears to be in stock. I submitted a question about that, we’ll see what they say. Geek Buying confirmed tablet is in stock. Will this support Netflix in HD? Everything looks great, except the screen specs. A 1920 X 1200 display at 224 PPI? Come on , Xiaomi! 2560 x 1600 would have been better. To be fair, that one will probably have the better screen, and still has a quite decent chipset. Well, it does have a MicroSD card slot on the left. Like a SIM tray style. Are you sure? From what I have read, that is indeed a SIM tray for the LTE version. It’s not a card slot. The official page on mi.com states it as an expansion slot. So I would think MicroSD support. But also better software support on Xiaomi side. Xiaomi will probably solve most of the bugs with software update and also Mi Pad 4 will receive new MIUI versions for 1-2 years. Also kernel sources will probably be released and there will be many custom ROMs for years to come. On the other side Alldocube will try to solve some bigger bugs with 1-2 updates and that will be all, no Android version updates, no custom ROMs and not all bugs will be solved. I have Chuwi Hi12 and it is excellent tablet, but there was only 1-2 software updates and that’s it. I have issues with Wi-Fi on Android when tablet can not connect to my network for not apparent reason even though signal is strong and all other devices are connected. It is well known problem which many users have and no one has found solution and Chuwi did not provide update for it. Also even after great many requests Chuwi didn’t wanted to release Kernel sources, so that custom ROMs can be made. I expect something similar with Alldocube as it is with Chuwi. Looks good, just a larger version of the Mi Pad 4 I reviewed, but with a fingerprint reader for added security. That Battery will be amazing as the 6000mah in the Mi Pad 4 is good for 10 hours use already. I’ll have to order one to review. Do you think that in near future Xiaomi will present something simmilar to IPad pro? Seems that every tablet what they do is a little copy of apple tablets. What do you mean ? What are the specs you are looking for ? I am looking for a tablet with Windows 10 or android, minimim 12,5 inch, max 13,5 with the screen ratio 3:2, eventually 4:3. Maybe you have some suggestions?